JOHANNESBURG, July 25 (Xinhua) -- From new global growth drivers to the international landscape and the global governance system, Chinese President Xi Jinping here Wednesday shared his thoughts on the changes the world is going to witness in the next decade. The next decade will be a crucial one in which new global growth drivers will take the place of old ones, seeing faster changes in the international landscape and the international alignment of forces, and witnessing a profound reshaping of the global governance system, Xi said while addressing the BRICS Business Forum in Johannesburg, South Africa. He said that a new round of revolution and transformation in science, technology and industries featuring artificial intelligence, big data, quantum information and bio-technology are gaining momentum, and they are giving birth to a large number of new industries and business forms and models and will fundamentally change global development and people's work and lives. "We must seize this important opportunity to enable emerging markets and developing countries to achieve leapfrog development," he told about 1,200 government officials and business people. Xi continued that emerging markets and developing countries already contribute 80 percent of global economic growth, and based on exchange rate calculation, these countries account for nearly 40 percent of the global economic output. "Growing at their current rates, these countries will see their economic output approach half of the global total in a decade," Xi said. "The collective rise of emerging markets and developing countries is unstoppable, and it will make global development more balanced and global peace more firmly based." Speaking of the global governance system, Xi pointed out that the world is moving toward multi-polarity and greater economic globalization amid setbacks. "Geopolitical hotspots keep emerging, and the dark shadow of terrorism and armed conflicts still haunts us. Unilateralism and protectionism are mounting, dealing a severe blow to multilateralism and the multilateral trading regime," he said. "The international community has reached a new crossroads; and we are facing a choice between cooperation and confrontation, between opening-up and a close-door policy, and between mutual benefit and a beggar-thy-neighbor approach," Xi said. Thus, the evolution of global governance system will have a profound impact on the development of all countries, particularly emerging markets and developing countries, and indeed on the prosperity and stability of the whole world, he said. 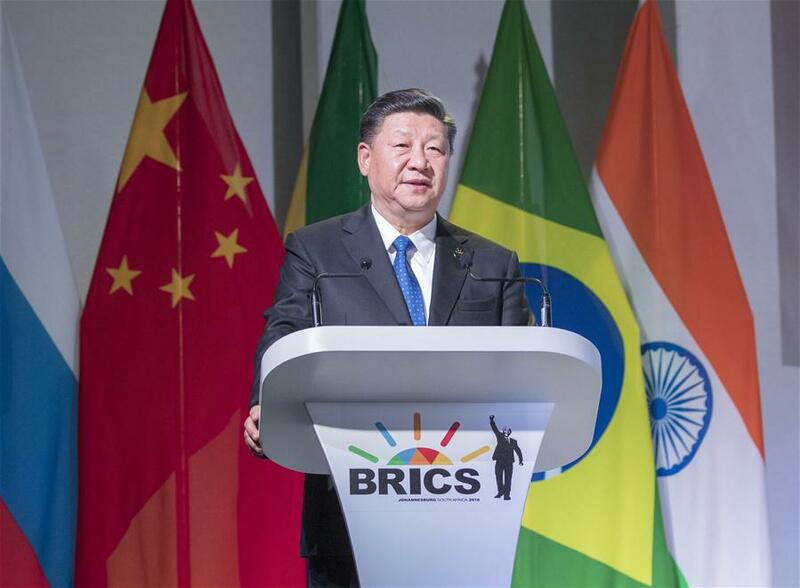 "We BRICS countries should keep abreast of the historical trend, seize development opportunities, jointly meet challenges, and play a constructive role in building a new type of international relations and a community with a shared future for mankind," Xi said.